^ "Values". The Council of Europe in brief. Retrieved 2017-04-21. ^ regjeringen.no (2014-06-25). "Thorbjørn Jagland". Government.no. Retrieved 2018-09-19. ^ "Jagland re-elected head of Council of Europe". POLITICO. 2014-06-25. Retrieved 2018-09-19. ^ "Chairmanship". Committee of Ministers. Retrieved 2017-12-13. ^ "How it works". website-pace.net. Retrieved 2018-09-19.
of Local and Regional Authorities. Retrieved 2017-12-13. ^ "Full list". Treaty Office. Retrieved 2018-09-19. ^ "Biography - Commissioner for Human Rights". Commissioner for Human Rights. Retrieved 2019-04-06. 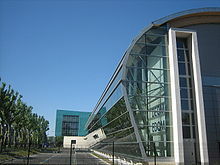 ^ "CoE Conventions". Conventions.coe.int. 31 December 1998. Retrieved 2012-02-11. 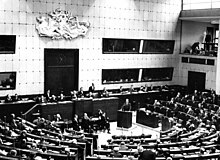 ^ "Council of the European Union". European Union. Retrieved 2012-05-19. ^ "The Council of Europe's Relations with the United Nations". www.coe.int. Retrieved 2017-08-25. ^ "Council of Europe and FIFA ink landmark deal on cooperation in shared areas". TASS (in Russian). Retrieved 2018-12-03. 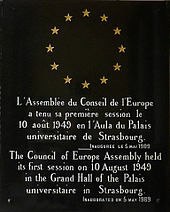 ^ "Logo of the Council of Europe". Council of Europe. Archived from the original on 2011-01-02. Retrieved 5 August 2008. ^ Gabanelli, Milena. "Il Consiglio d'Europa e il caso Azerbaijan tra regali e milioni". Corriere della Sera (in Italian). Retrieved 2017-01-30. ^ a b (www.dw.com), Deutsche Welle. "Russia withholds payments to the Council of Europe | DW | 01.03.2018". DW.COM. Retrieved 2018-09-19. ^ a b Buckley, Neil (November 26, 2017). "Russia tests Council of Europe in push to regain vote". Financial Times. ^ "A Classic Dilemma: Russia's Threat to Withdraw from the Council of Europe". Heinrich Böll Stiftung European Union. Retrieved 2018-09-19. ^ "Secretary General: Russia leaving the Council of Europe would be a "huge setback" for human rights". www.coe.int. Retrieved 2019-01-06. ^ Sputnik. "Lavrov: Russia Won't Wait For Expulsion From Council of Europe". sputniknews.com. Retrieved 2019-01-06. ^ "Russia will quit Council of Europe if opponents insist on its expulsion, says Lavrov". TASS (in Russian). Retrieved 2019-01-06.